The path, such as it was, appeared to come to a dead end with no other option but to scramble down three metres of sheer rock face, not a prospect I was relishing. Feeling sure there must be another route, I traversed the width of the canyon only to find myself nose against the cliff face. But as I reluctantly made my way back I noticed a cave tunnel where moss covered footholds dripping with fresh water from underground currents lead down to the bed of the stream below and I remembered that this was the way. Another quarter of an hour of scrabbling across rock falls and scanning the valley floor for signs of a way through and I arrived at a detour board which pointed the way over giant boulders wedged beneath rock overhangs. This was no easy detour and more than once I contemplated taking my chances with the closed off, easier path which was prone to rock fall. Two hours and 20 minutes into the hike, I rounded a clump of cane backed by boulders to hear one of the sweetest sounds, waves crashing on a shore, and I knew I was nearing Masca beach. Arriving onto the beach some 20 minutes later I was able to watch my fellow hikers that day as they emerged onto the pebbles from the ravine. 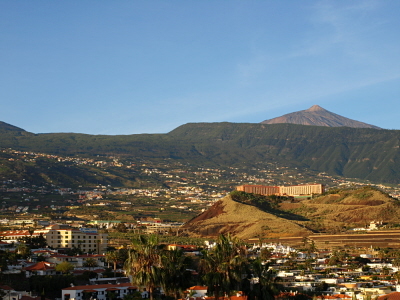 Groups of schoolchildren looked as fresh as the when they disembarked from the bus in the village of Masca; a young couple hugged their middle aged companion in congratulations as she stumbled, exhausted onto the beach, her grin as wide as the mouth of the ravine. 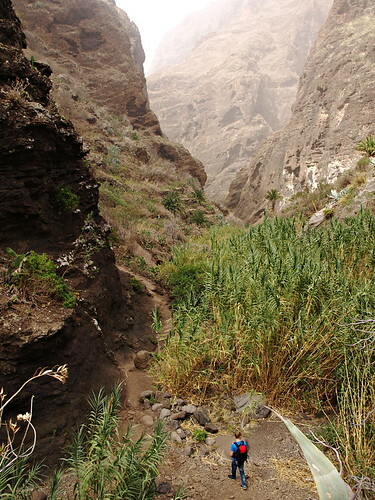 How fit do you need to be to hike the Masca Barranco? 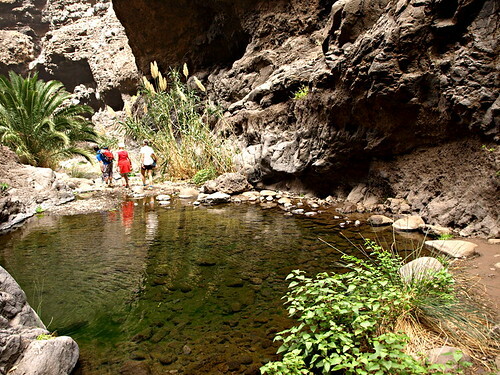 After the Barranco del Infierno in Costa Adeje (The Old South Island Walks), Masca Barranco is the second most popular hike on Tenerife and one of its down sides is the volume of other hikers you encounter, particularly in large guided groups. But don’t let its popularity fool you into thinking it must be easy. 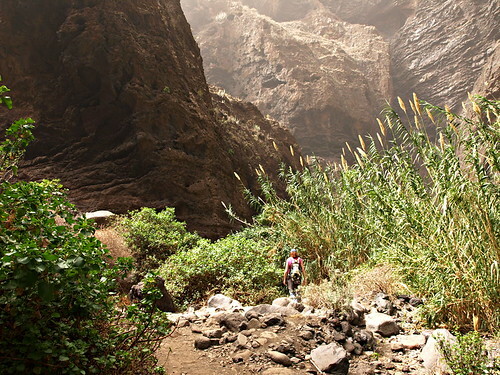 Unlike the manicured paths of Barranco del Infierno, Masca Barranco is an adventure hike covering some of the toughest terrain on the island which requires stamina, supple joints and constant concentration to avoid injury and/or losing your way. Every year people sustain injury or get lost in Masca Barranco and most of those people should not have been there in the first place. When we were there a few weeks ago, we saw several people who were finding the challenge too much. An elderly gent with a German hiking group was having to be helped to sit down on a rock to recover his balance and breathing while his fellow hikers crowded around the path, making it very difficult for other hikers to manoeuvre past. Arriving back at the detour we had to wait for several minutes while an elderly lady was helped down by her family, her face racked with pain. Her daughter told us her mum was experiencing bad pain in both hips. Is it worth hiking the Masca Barranco? Yes, absolutely. If you’re a relatively experienced hiker with a good level of fitness, you’ll find this assault course through Masca’s prehistoric gorge nothing less than incredible. 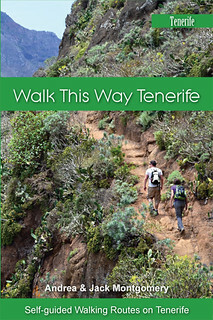 Set at the foot of the dramatic Teno Mountains and beginning in the charming rural hamlet of Masca, the trail begins with a steep trek down the palm and fruit tree studded bank of Masca Barranco (dry ravine) to a bridge over the valley floor and twists and turns its way on a prehistoric, six kilometre journey to the sea. 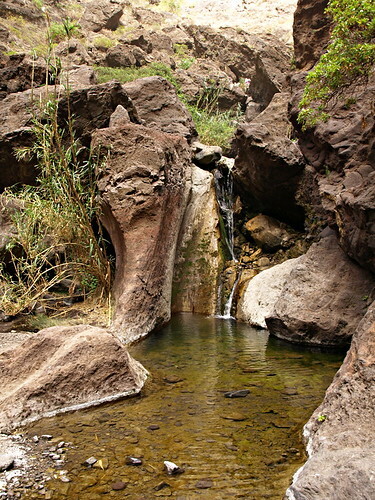 Beginning amongst giant agave spikes and prickly pear cactus, the terrain gives way to the valley floor where, fed by underground currents, mini forests of willowy cane and lush ferns frame gentle waterfalls and still ponds of emerald translucency. As you walk deeper into the ravine the cliff walls rise and narrow, blotting out sunlight from the valley floor and harbouring basalt columns and deep caves within their faces. Sounds bounce off the rock surfaces and ricochet around the gorge as you tread stepping stones through the water, duck beneath overhangs, cling to rope wire in the rock face and marvel at the sheer beauty of this extraordinary landscape. 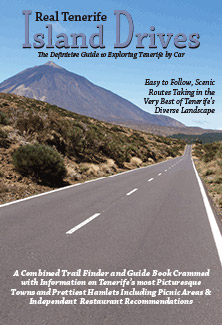 How long does it take to walk the Masca Barranco? 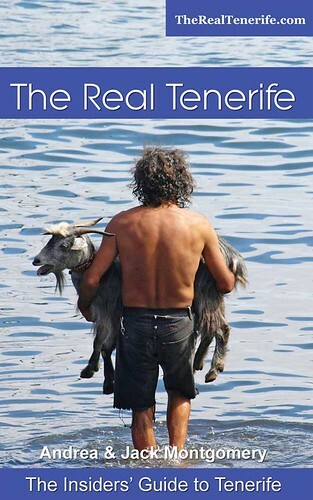 If you talk to local men in the village they’ll tell you it takes them two and a half hours to walk down the barranco and half an hour more to walk up, as they cradle their expanding bellies and laugh. I met a walking guide who told me he did it in two hours, we took 2 hours 40 minutes down and 2 hours 45 minutes back up but on that day there were groups who took up to six hours to complete the journey from the village to the beach. Find a pace that suits you, take the time to stand and take in your surroundings and if you’ll take my advice, arrange to be collected or have a second car at Los Gigantes and buy a ticket for the boat in the village. Hiking Masca Barranco from Masca to the beach one way is a challenging and rewarding hike, doing it down and back is nothing short of masochistic and your legs will be bitching about it for days afterwards. 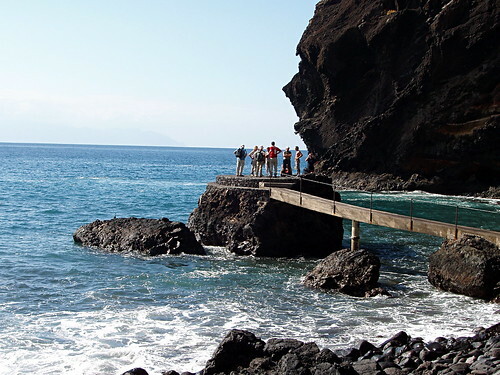 Masca Barranco hike is included in our Island Walks series: WestWorld – Masca, Garachico and El Palmar and is one of a series of seven Island Walks sets of detailed walking directions in PDF format available to buy online. We don’t organise walking holidays John. There are a couple of UK companies who have walking holidays on the island. We work with Slow Travel specialists Inntravel and have just put together two new packages with them which we cover some areas nobody else does. 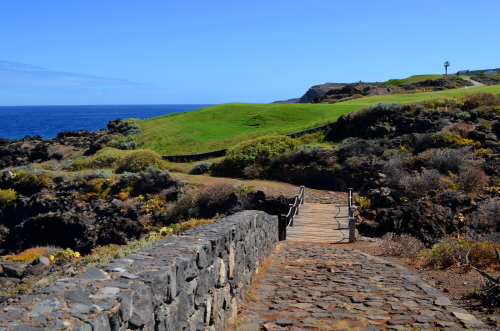 But Masca isn’t one of them, mainly because everybody knows about it and, wonderful though it is, it’s the busiest walking route on the island. There are local walking companies. They don’t organise holidays but they do arrange walks. Which one would suit would depend on where you’re planning on staying. Masochistic? 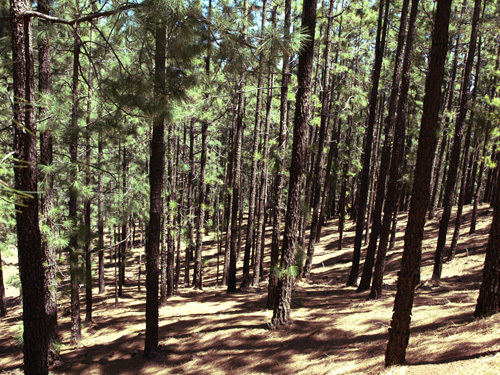 Common, if you are fit and do appropriate exercices before and after the hike, it should be OK as with all over longer hikes. We just had a wonderful day with my girlfriend in Masca trail. 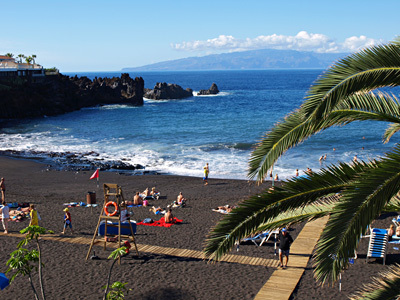 We went by boat to the beach, then up to Masca village and down to the beach again. There we enjoyed refreshing ocean and its waves. A little bit salty as usual, but after about 6 hours hike there can’t be anything more refreshing. We came back with the same boat to Los Gigantes. I will let you know if there will be any bad things with our legs, but it should be ok as we went even more in Lunar trail even that one is much easier.